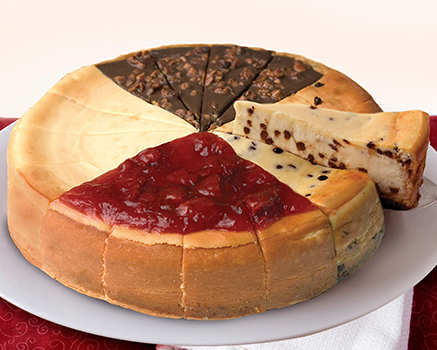 Please any chocolate lover with four to five slices each of our rich Candy Bar made with Heath® Toffee Bars, all-American Chocolate Chip and dreamy Chocolate Caramel Pecan Cheesecakes. INGREDIENTS: Cream Cheese (Pasteurized Milk and Cream, Cheese Culture, Salt, Carob Bean Gum, Guar Gum), Sugar, Sour Cream (Cultured Nonfat Milk and Cream, Corn Starch, Whey, Guar Gum, Carrageenan, Carob Bean Gum, Enzymes), Chocolate Chips (Sugar, Chocolate, Cocoa Butter, Butterfat [Milk], Vanilla and Salt), Egg, Wheat Flour, Butter (Cream, Salt), Powdered Sugar (Sugar, Corn Starch), Modified Corn Starch, Cocoa Processed with Alkali, Egg Whites, Salt. INGREDIENTS: Cream Cheese (Pasteurized Milk and Cream, Cheese Culture, Salt, Carob Bean Gum, Guar Gum), Sugar, Sour Cream (Cultured Nonfat Milk and Cream, Corn Starch, Whey, Guar Gum, Carrageenan, Carob Bean Gum, Enzymes), Egg, Caramel Topping (Corn Syrup, Sweetened Condensed Skim Milk [Condensed Skim Milk, Sugar], Cream, Water, Butter, Maltodextrin, Salt, Carrageenan, Mono- and Diglycerides, Xanthan Gum, Natural Flavor, Sodium Bicarbonate), Wheat Flour, Butter (Cream, Salt), Pecans, Whipping Cream (Cream, Carrageenan), Chocolate Chips (Sugar, Chocolate, Cocoa Butter, Butterfat [Milk], Vanilla and Salt), Powdered Sugar (Sugar, Corn Starch), Modified Corn Starch, Cocoa Processed with Alkali, Water, Invert Syrup, Egg Whites, Natural Caramel Flavor (Water, Propylene Glycol, Glycerin, Caramel Color), Caramel Color, Salt, Stabilizer (Gum Acacia, Propylene Glycol Alginate, Xanthan Gum). INGREDIENTS: Cream Cheese (Pasteurized Milk and Cream, Cheese Culture, Salt, Carob Bean Gum, Guar Gum), Sugar, Sour Cream (Cultured Nonfat Milk and Cream, Corn Starch, Whey, Guar Gum, Carrageenan, Carob Bean Gum, Enzymes), Heath® Toffee Bar Pieces (Milk Chocolate [Sugar, Cocoa Butter, Chocolate, Nonfat Milk, Milkfat, Lactose, Soy Lecithin as Emulsifier, Salt, Vanillin], Sugar, Palm Oil, Butter, Roasted Almonds, Salt, Artificial Flavor and Soy Lecithin), Milk Chocolate (Sugar, Chocolate, Milk, Cocoa Butter, Soy Lecithin as Emulsifier, Vanillin [Artificial Flavor]), Egg, Wheat Flour, Butter (Cream, Salt), Powdered Sugar (Sugar, Corn Starch), Roasted Almonds, Milk Chocolate Coating (Coconut Oil, Sugar, Milk, Chocolate, Cocoa Butter, Soy Lecithin as Emulsifier, Vanillin [Artificial Flavor]), Whipping Cream (Cream, Carrageenan), Cocoa Processed with Alkali, Evaporated Milk (Milk, Dipotassium Phosphate, Carrageenan and Vitamin D3), Egg Whites, Natural Caramel Flavor (Water, Propylene Glycol, Glycerin, Caramel Color), Salt, Caramel Color, Stabilizer (Gum Acacia, Propylene Glycol Alginate, Xanthan Gum).